The new Model GD-70D smart gas detection transmitter series sets a new standard for performance, flexibility, and versatility. The long life high capacity pump and wide variety of sensing elements are replaceable in a few seconds, with no tools required. The smart sensors retain all calibration and sensor-specific data in non-volatile memory, so sensors can be hot-swapped in the field with no programming required. 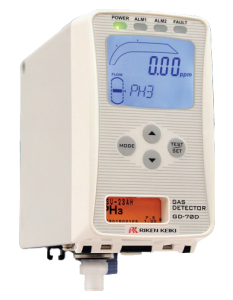 The GD-70D sample-draw transmitter offers an array of sensor technologies unmatched in the industry, including unique offerings, such as our hydrogen-specific or LEL versions.The sensors also retain calibration information, which means they can be conveniently calibrated separate from the transmitter, avoiding transport of calibration gases to field locations. The GD-70D firmware automatically corrects for long-term zero and span “drift” minimising maintenance and maximising reliability. The GD-70D can be used as a stand-alone device, offering a number of communication protocols to existing PLC systems, or can be integrated with RKI’s Beacon series of single and multi-channel controllers. All GD-70D transmitters include a large, easy to read integral LCD display, tri-colour bar graph for visual notification of alarm status, programmable low and high alarm relays, and fault relay. Pump flow is self-tuning for maintenance-free operation. Because all GD-70D base units are identical, sensors can be interchanged with no programming or tools required, resulting in maximum flexibility to the user.